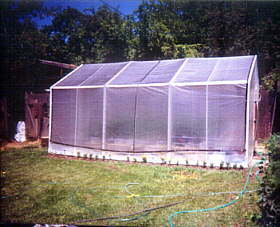 Here I hope to show a way to build a greenhouse. One that I came up with that would be strong, simple, and a size big enough to grow more than just a few plants. Building this way is much cheaper than to buy the same size out right. More good news is it can be move if need be, disconnect water hose and power and maybe eight men and your good to go. I enjoy coming up with things like this, I do things like this all the time. But simply put I framed a portable carport with 2x4s. The wood was needed so that there be a way to hold down the plastic. 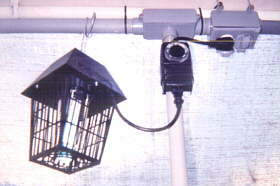 Because the carport was made of round steel pipe, the wood was secured by brackets, ones that were for installing down spouts to household gutters. Then I secured the wood to its self with nails and some metal strapping. Sides were framed to support exhaust fan, vents, swamp cooler, door. No windows needed, I did'nt even need the screen door I added. 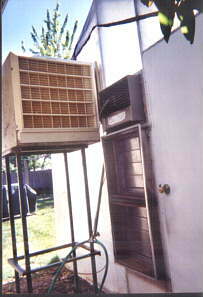 If the temp inside is to hot the swamp cooler or vents take over. In Southern Oregon we get all kinds of weather. 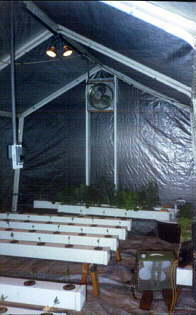 I keep the tomatoe shade tarp on year around just because of hail, snow, cats and just to prolong the life of the plastic. All the power, lights, fan, vents, door goes up before the plastic. Maybe even the floor, I choose to do that after. I bought most of my supplies through Hydro-Gardens over the net. They have a free catalog which is a great reading soure as well. 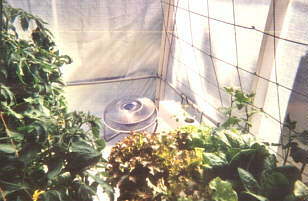 I installed all weather proof outlets all around the sides even up high between the flood lights for any hydroponic lighting you might want. 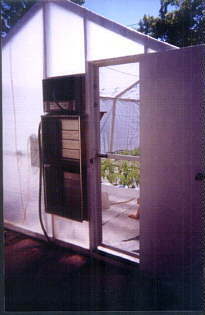 I ran straight down in the middle, some electrical conduit from the roof line and installed the thermostat so it was right in the middle of the greenhouse. I had the thermostat turn on certain plugs, some for hot some for cold. I plug in the swap cooler into the right plug and it turn on with the fan as the temperature goes up. The picture above and below you can see the swamp cooler on top of the vents. Now I have added another big one to the side of it. Before I made a home made swap cooler over the vents as well. I took this down when I installed the big one because it was not needed. It turns on with the exhaust fan. 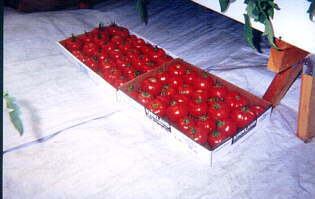 I keep the temp around 65 now for the tomatoes. You can see the fuse box installed just to the side of the vents. 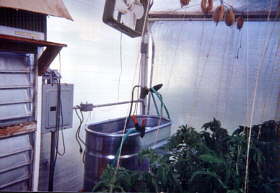 To the right of that I now have a hundered gallon utility sink which doubles as a tank to mix my nutrient solutions. I am very happy with the plastic I chose for the greenhouse. I ordered it off the net from North Dakota. It look like the blue utility tarps you can buy at the hardware store but clear. Its water proof and UV protective on both sides. They said here in Oregon I should get seven years of life or longer. I believe them, this plastic is woven which does three things. It disperses the sun light which keeps away sun spots, cut down on the shadows alot, plus its tuff stuff! To read more about this plastic click here on Super Poly. Another neat trick was how I thought to tack the plastic on the wooden frame. Again I wanted to keep it light and easy, and not something that will brake down. Wood molding does brake down with bad weather and it will split with staples. So I used white electric fencing ribbon the kind down at the grange used to fence in horses. This is light, strong, white, staples great. You can see how I used it for extra support down the sides of the greenhouse ( look at first picture ) I was told to wait for a sunny day to put on the plastic to make sure it goes on tight. Well I couldn't wait and I should have. But its has gotten a little tighter with time. As for the floor a weed felt bearer was rolled out and then laid down on top was a white tarp to help keep the shadows down. Keep the floor clean and I do mop it from time to time. This year I went through and hot glued all the seams around the floor which has worked very well. Building the two by four framing over the carport frame to have something for the plastic attach too. 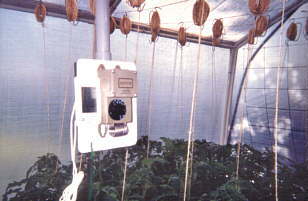 The Temp readings and thormostat controls found in the middle of the greenhouse, coming down from the roof line. 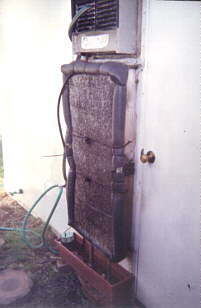 I installed this bug zapper which takes care of those nasty pests that make their way in through the door. It turns on for two hours after sundown. I have fans turns on with timemers to keep the air aways moving.